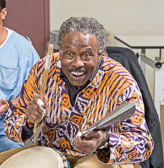 Drumming at Valley State Prison - 2015 Dec.
Djembe drumming, taught by Abdullatif Bell Touncara. Organized by the Alliance for California Traditional Arts and Sponsored by the California Arts Council and the California Dept. 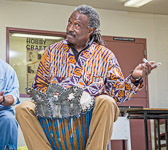 of Corrections and Rehabilitation as part of Arts in Corrections.